Few active producers are as prolific as U.K.-based electronic musician Max Cooper. The young artist has released roughly fifteen EPs in the last three years alone, in addition to being a very active remixer. 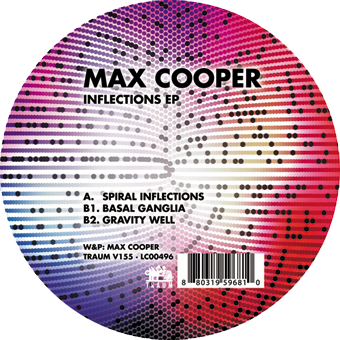 Cooper's latest offering, Inflections, which was recently released on Germany's Traum Schallplatten, sees the producer favouring sounds similar to those on some of his earliest releases, though Max pushes his own signature sound in new directions. The soothing pads of "Gravity Well" evoke similar nostalgic moods to those of some of his previous ambient works, namely "I" and "The End of Reason" which were released back in 2009 as a part of his Symphonica and Harmonisch Serie EPs, respectively. While there are similarities linked in all three of those tracks, "Gravity Well" is a new take on an otherwise familiar sonic "Cooper" palette; the shimmering synthesizer accents and long-drawn pads are complimented by Max's technical and schizophrenic glitching percussion. The highlight of Inflections will be, for many, the hard hitting sounds of "Basal Ganglia," in which Cooper combines an extremely aggressive sporadic synth growl with some of his most house-like sounding beats to date, albeit a type of house that only Cooper could pull off. Tapping the same house-like vein, the EP's opening track, "Spiral Inflections" works a stuttering bass line that sounds as though it could easily fit into an older Chicago house track underneath looping arpeggios and one of Max's trademark low-end leads, which carries the track through almost eight-minutes of heady dance-floor grooves. With an additonal remix from fellow Traum artists Microtrauma available digitally, Inflections is another impressive addition to the increasingly lengthy Max Cooper catalog.